Horses sweat when the weather is hot or they have been exercised. Sweating is your horse’s way of cooling down and reducing his temperature. However, when a horse sweats they sweat differently to humans in that they can lose up to 4 gallons of sweat every hour! What’s more, horse sweat contains high volumes of water and electrolytes, so when a horse sweats too much is can cause foaming at the mouth, fainting, and even death. So, it’s important to learn about horse sweat, the warning signs, and what’s normal so that you can help keep your horse cool whether he’s in the stable or out in the field. Horses cannot regulate their body temperatures in the same way we do as humans, instead the only way they can cool themselves is by sweating. And the harder your horse works, the more he sweats. It is the evaporation of the sweat your horse produces that cools your horse down, not its presence on the skin. But, why and how do horses sweat? If your horse produces more heat in his body than he can get rid of through breathing, his core temperature begins to rise and signals are sent to his sweat glands to be distributed onto the skin. As the sweat then evaporates, it takes heat away from the skin, helping to reduce your horse’s body temperature. Horses sweat whenever they are overheated and it can happen just as much outside in the field as it does inside the stable. A horse sweating in his stall is not uncommon but is can be a sign of a poorly built stable. Horse sweating in the stall can be due to a number of factors, including: poor stable ventilation, humid air in the stall, badly regulated heating, and hot weather. If you discover your horse is sweating a lot when he is stalled, it’s important you make a few changes so that you can effectively manage the problem. The main way to reduce horse sweating in the stable is to ensure your stable is professionally-built and well-ventilated to allow for a cool circulation of air around your horse. You can also keep humid air to a minimum through proper cleaning management of the stall and proper ventilation. While horse sweating in stalls is not uncommon, there are steps you can take to regulate it so that your horse does not become unwell. When horses sweat, they can lose a lot of important electrolytes that are integral for their health and hydration. Excessive sweating caused by dehydration is one of the greatest risks to your horse. When humans sweat, they lose mainly water and the water loss causes low numbers of electrolytes and thirst as a result. However, horses have a higher number of electrolytes in their bodies, so when they sweat they are slower to feel thirsty and can easily become dehydrated. If you’re experiencing a hot day or you’re putting your horse through a strenuous exercise regime, ensure your horse stays hydrated and gets the replenishment he needs to avoid dehydration. Add electrolytes to your horse’s water to help him stay hydrated. There are a number of reasons why your horse sweats and physical condition is one of these. The physical fitness of your horse can cause sweating to different degrees and can be one of the ways you help regulate the amount your horse sweats. Unfit horses may sweat more easily and earlier into the workout than horses in better physical condition. If your horse sweats a lot, you can help reduce this by improving their fitness levels. As your horse becomes more physically fit through regular exercise routines, Regulating your horse’s body temperature can be done through regular exercise and improving your horse’s physical fitness levels. It may be that your horse is unable to regulate his body temperature. This could be for many reasons, including humidity in the air, fatigue, and more. Inability to regulate body temperature will cause your horse to overheat, faint, and suffer heat stroke. If your horse is sweating profusely but is not replenishing his supply of water, he’s at significant risk of dehydration and may start experiencing problems with his circulation, digestion, and even damage to his organs. In extreme cases of sweating, dehydration can be fatal. For some horses, sweating is not possible. This condition is called Anhidrosis and can affect any horse, however is more common among horses in hotter climates. While excessive sweating can be dangerous for horses, as we’ve been discussing, a horse that does not sweat can be in even greater danger because he has no effective way of cooling himself down. – Hose or sponge him with cold water to keep him cool. Rapid, shallow breathing is particularly common in horses after they’ve exercises in hot weather, but this should regulate itself and return to normal after a short period of rest. If your horse’s breathing rate remains high, he may be panting to try and cool himself down alongside excessive sweating. Let him rest in a shaded, cool area and provide him with plenty of water to re-hydrate. Having a high temperature after exercising is normal for a horse, but if your horse’s temperature does not drop a degree or two within 20 to 30 minutes of resting, you should be concerned. When a horse is dehydrated and sweating profusely, he can become lethargic, turn down food, and generally exhausted. If you notice these warning signs, it is essential to re-hydrate your horse with electrolyte-water as much as you can. A lack of resilience in your horse’s skin is a common sign of dehydration and a great way to test whether your horse’s fluids are low. All you have to do is pinch a fold of skin in three places along your horse’s body; high on his shoulder, midneck, and low on his shoulder. If your horse is properly hydrated, his skin will snap promptly back into position. If it does not, he needs re-hydrating. When you listen to a horse’s gut, a sign of good health is when you hear lots of bubbles and gurgles. This is caused by the amount of water held in your horse’s large intestines that he draws on as a reserve. However, when your horse’s gut is quiet, he is beginning to dehydrate and his gut motility is slowing as a result. Re-hydrate your horse as soon as you notice his quiet gut to help prevent any digestive problems. Knowing when to call your veterinarian can be difficult, especially when it comes to horse sweating. The severity of the situation depends significantly on your horse, his general attitude, and whether any of the warning signs have raised alert. 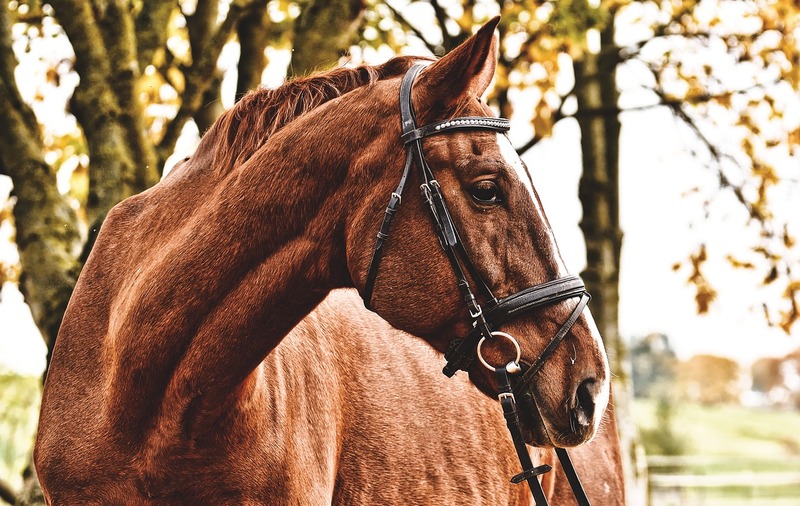 If your horse seems dull or disorientated, is turning down both food and water, and hasn’t cooled down despite your efforts, it is best to call your vet. Your veterinarian can check over your horse, assess his condition, and – if needed – administer extra fluids via a stomach tube and provide any additional support if necessary.